The earliest known plane was a flat-bottomed tool for smoothing wood and nothing more. The only plane I owned when I started working with wood was a Stanley No.5, Type 4 plane. It wasn't tuned properly, the tote was a replacement my grandfather had made from a walnut board that never did fit the plane quite right, and because it was a Type 4 the depth adjuster knob turned the opposite direction from the later Stanley. It had most of its japanning and the sides had a wonderful patina on them that I later discovered was really rust. The iron was not original to the plane, the original iron mostly likely got worn down to nothing or was stolen from the plane while it was at a job site. I have no idea when my grandfather acquired this plane, perhaps he got it through a trade or barter for some carpentry job he did in the early part of the 20th century. I know he didn't buy it brand new, if I remember correctly, Type 4 Stanley planes were manufactured between 1874-88, my grandfather was born in 1881! It was my smoothing plane, jointer plane and when pressed into service it was a really big block plane. I remember at the time I read in some woodworking book that No.5's were called "jack" planes because, as the author stated, you could use them for just about anything - dimensioning stock, smoothing stock and jointing edges, it was a "the jack of all trades" kind of plane. It was all that I needed, I didn't have much money back then, new tools were a luxury, I got by with what I had. As time went on and I gained more experience in wood working, I purchased several Stanley No.4 smoothing planes because books and magazines stated those were "the planes" a woodworker should own and use. I spent quite a bit of time and effort to "tune" those planes, again, according to the information found woodworking books and magazines. Which each new plane I flatten the sole, I sharpened the edge of the chip breaker so it mated perfectly with the back of the iron, the iron was regulation shaped and sharpened and you know what? I never could get those planes to work the way I wanted them to. The iron would chatter or dig in at the wrong place, there was always something about those planes that fought me at every turn. Whenever frustration would set in with a No.4 plane I turned to my faithful No.5. If I kept the iron of the No.5 sharp the plane always worked when I needed it to. Maybe it worked well for me because of the longer length or that it was the first plane I learned to use. The only other size plane that works well for me as a smoothing plane is a No.3 plane, we all know a No.3 is a smoothing plane. Today, I use the No.5 to thin down classical guitar tops, backs and sides, I need to be fairly precise when doing this activity. Tops and backs need to be within the 1.8mm-2.3mm range, sides a little less than 2mm, I find that the the added weigh of the plane helps it go through the wood better, thus easier for me to control; the extra length takes care of the high spots on the wood better than a regular smoothing plane and it is much lighter and more wildly than a No.7. 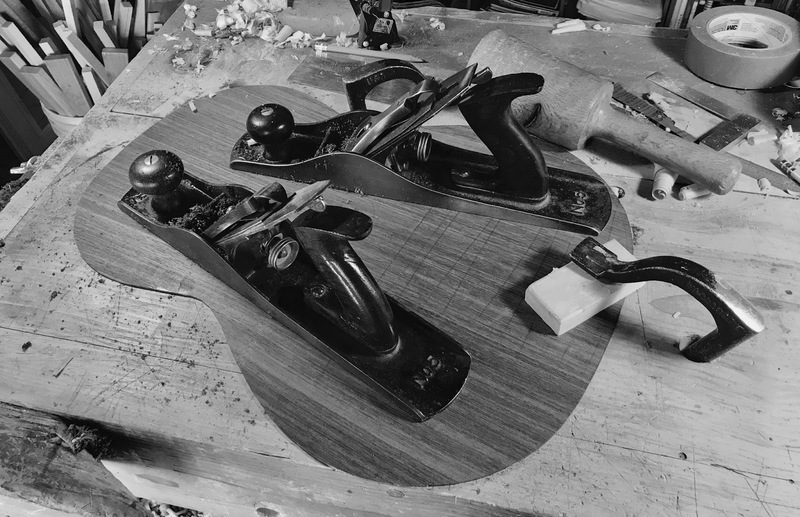 I have never set up a No.5 plane to be a scrub plane, I have a No.40 Stanley scrub plane for that, one of the No.5's has an iron set up for smoothing, the other No.5 has a toothing plane which is used to help dimension guitar parts. I sold the No.4 smoothing planes and an extra No.7 jointer plane last year in an effort to downsize my tool collection. I don't miss the No.4's and I tend not to recommend them to people just getting into woodworking, I suggest it may be better for them to start with a No.3 smoothing plane and I tell them that Alan Peters thought a No.7 was the best one to use. Once you have decided what your focus is in woodworking, be it making Federal style furniture, Welsh stick chairs or classical guitars, you will discover what tools work best for you and when you do, stick with them! I reach for my #4 first, but my 5 1/2 is second at hand. I've had a bunch of planes, new and old, but most are sold off or just sit on the shelf under my bench except those two.